Bigger, taller, more exciting: this city, which up until 2007 housed the tallest building in the world in the Taipei 101 skyscraper, is striving to set new records. Since the spring of 2011, the W Hotel has been playing its part in this: design fans come from all over the world to experience its ultra-modern mix of styles. Many of the 405 rooms and suites look out onto the 508m tall Taipei 101 tower. The "Wow!" factor, guaranteed by the Starwood group's internationally successful W boutique hotel brand, can be attributed to the bar of the same name, with its view of the Taipei skyline, and also to the bathrooms. Why? Because these are furnished with Axor products. Amongst other things, at the W Hotel Taipei urban chic means: designer furniture and lighting, colours with a retro touch and classically comfortable cushions and bedding. Add to that the comfort of a daybed by the window, with a view overlooking the city. A similar view is offered by the partially open-plan bathroom, which merges with the living and sleeping area, as is the current trend. In some rooms guests can even enjoy panoramic views from the bath tub. In addition to the spa, an outdoor pool on the tenth floor offers a special relaxing experience with a view. 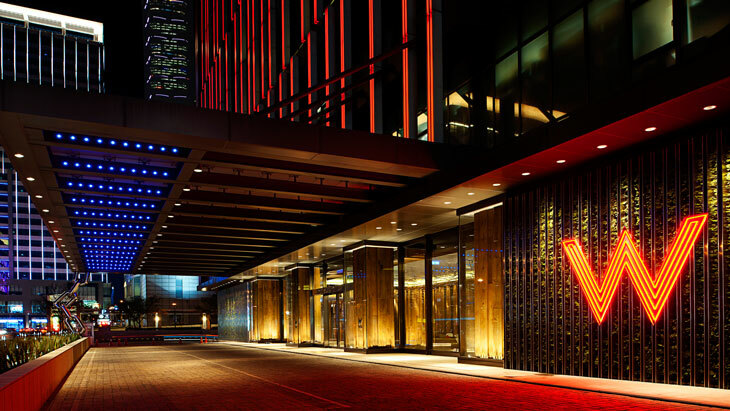 In Taipei the W Hotel sets new standards in luxury. Mixers from the Axor Citterio bathroom collection were selected for the bathrooms. With their brilliant surfaces and the combination of defined edges and rounded shapes, these radiate a feeling of luxury and top quality.